I took another family trip to Doland, South Dakota for my wife's grandmother's 80th birthday. The town is fairly birdy but I've had little time to explore. I saw some good things there earlier this summer and brought my binoculars along just in case. It seemed generally quieter, no Western or Eastern Kingbirds, only one faint Western Meadowlark calling in the distance. One morning I went to check out a little pond near where we were staying and while there wasn't anything there I could see some gulls circling not far away. Hmm. The next day I had a spare moment so I hopped in the car and drove down the road. I took a right on the first road I came to and it was rural dirt road. There wasn't even a sign and I almost missed it. The only reason I slowed down was that I saw some power lines and I remembered the gulls being near the power lines. I drove down the road until I saw a little pull-off and the following sign. This is birder paydirt. 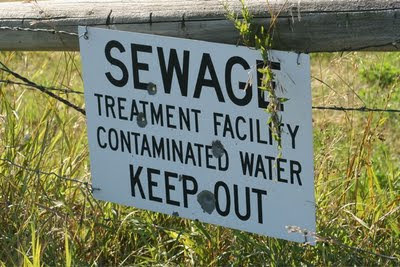 We are a sick lot who spend our time hanging out at sewage treatment ponds just because that is where the birds are. The wording of this sign brings up an interesting grammatical and perhaps ethical question. Are they saying keep out of the water or out of the entire facility? Luckily you can get good views of the ponds even without going over the barbed wire fence. 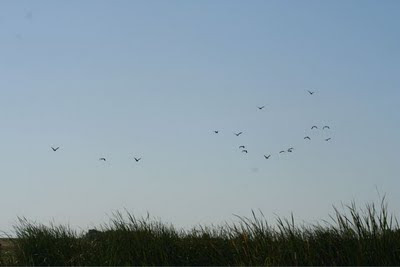 Fall migration isn't in full swing yet but I did see some good birds. 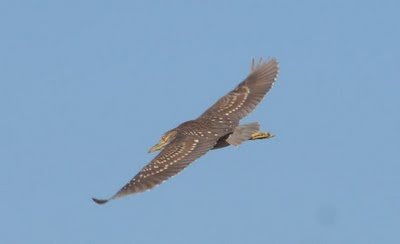 There was a flock of about 21 Black-crowned Night Herons flying overhead. When they circled around I managed to snap a few closer shots. This is an interesting one since it is of a juvenile bird and they look quite different than the adults. They have a real American Bittern quality to them. There were also numerous ducks, including a lot of Northern Shoveler. The gulls all turned out to be Ring-billed Gulls. A smaller white bird was hanging out with them at one point but when I got close enough to see it had vanished. I found myself wishing I had brought a spotting scope. Here's an example of why. How many birds can you count in the photo below? I uploaded it full quality so go ahead and click on it and count. I'll wait. All done? I count eight birds in the photo. All ducks swimming at the base of the rocks. In theory there is a ninth bird. Somewhere in there is supposed to be a Spotted Sandpiper but it has completely disappeared in the rocks. I swear it was there when I took the photo! Also in the area were Yellow-headed Blackbirds, Barn Swallows, Mourning Doves, American Goldfinches, Killdeer and probably more things I missed. Next time I go back I'll have to stop in to see what else turns up. Here's where the ponds are if you happen to be birding in the area.